Ira’s visual translation of Apollinaire’s Les Fenêtres poem into a digital city map titled Vista was commissioned for a book on visual poetry and translation by Manuela Perteghella and Eugenia Loffredo, One Poem in Search of A Translator, 2008. The ‘pictorial’, or better the ‘chromatic’ qualities of Les Fenêtres are explained by its relationship with Delaunay’s series of paintings Les Fenêtres Simultanées. 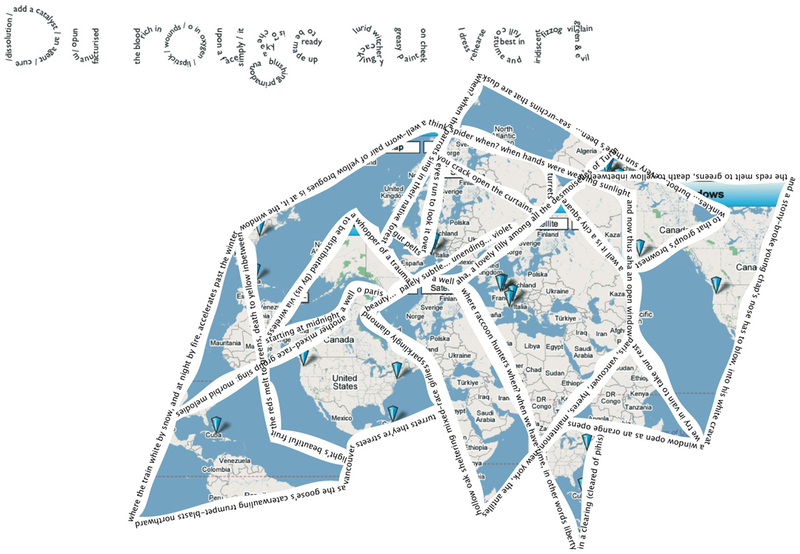 In Vista the simultaneity of the Apollinaire’s text and its verbal images and cartography are exemplified into a map. Here the graphic surface of the page yields the multiple square frames, and a fragmented geographical map opens up like cubist windows on the world, onto cities, and possible voyages. The poem-map is exhibited both as a poster and as smaller folded maps which are available to audiences to take home and engage with ideas of poems translated as visual texts. Ira Lightman is a conceptual poet and artist. Among his published poetry Duetectera (2008 Shearsman) and Tranceleated (from Coinsides) for ubu editions (www.ubu.com). In 2000 he started making Public Art. In Spennymoor, he devised the Spennymoor Letters, for which he won the Journal Arts Council Award for “innovative new ways of making art in communities”. He has mapped the Northumberland National Park’s cultural heritage in 3D, and in the Wansbeck area of Northumberland he has made trees out of family trees. He has also made conceptual pieces for national radio and a science fiction play The Coming of the Wopoli.